So I’m starting to watch the new X-Men anime series that came out recently. The opening scene in the first episode revolves around Cyclops screaming “Jeeeaaaaaannnnnnnn!” several times. Priceless. Also, Phoenix is in it, and each one of her individual um … “assets” … is larger than her head. By like, miles. More gruesome details to potentially follow if I ever get through more episodes. YEAH! THIS! VERY THIS! This is what I wanted from this book! Amazing. So, I never read any of the original Crossgen titles back when they were around. I checked out Marvel’s versions of Ruse and Sigil recently, so I thought—okay. Mystic. Let’s do this. G. Willow Wilson and David Lopez as a team has to be good, right? I’m ashamed to say I have not read Wilson’s Air, nor her Cairo, but I’ve heard great things and they’re definitely in the “to be read” pile. I also loved Lopez on Hawkeye & Mockingbird, and seeing some of his preview pages for this instantly guaranteed I’d check it out. While I can’t comment on this book in relation to its previous incarnation, I can only address what I’ve read here. And what I read here is wonderful. The story focuses on two orphans, Giselle and Genevieve, trapped in a boarding house and working to pay off the “debt” they’ve incurred to their headmistress for feeding them (slop), clothing them (rags), etc. 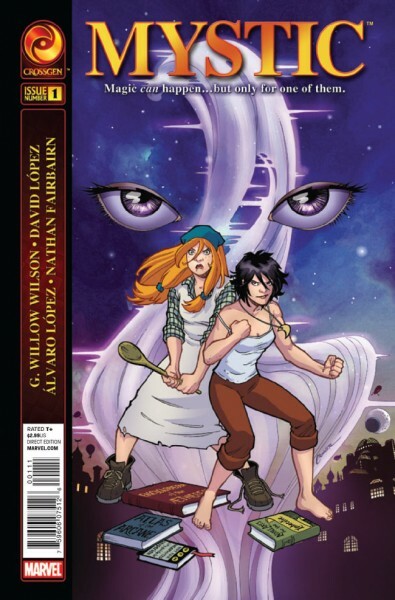 Set in a steampunk world called Hyperion and rendered beautifully by Lopez, Genevieve aspires to learn all she can about the “noble arts” and to become a mystic apprentice. Giselle, the more realistic and/or pessimistic of the two, has pretty much resigned herself to the idea of life in the boarding house despite its misery. The girls are eventually caught sneaking into an off-limits area of the house, and they subsequently manage to flee, climbing over and past the fence that cages them in. What happens next is the best part of the story, so I won’t spoil it for you. Some of the unfortunate clichés we begin with here—the boarding house as a prison; the seemingly evil and mean headmistress; etc.—are pretty much the only strikes I have against this story. Even then, I feel like much of that can be blamed on the fact that this is only a miniseries—you really can’t take up much time building an elaborate setup—and I’d wager that Wilson had to make this concession for the sake of fitting more pertinent things into the next three issues. I’ll give her that leeway under the assumption that the rest of the story will pick up the slack, and frankly, even a cliché-laden start is better than most original starts on other minis. I need only point to the Wolverine and the Black Cat for evidence there. As a whole, I loved this first issue. Who’s the colorist on this—Nathan Fairbairn? I’m unfamiliar with him, but he deserves a major nod—the colors on this book are FANTASTIC. Wow—just excellent stuff. Really gives life to Lopez’s pencils. It kind of reminds me of something out of a Disney movie—it feels like these characters can just leap off the page any minute and start singing a musical number about their hardships. I don’t know about you, but that’s a plus for me. Bring on issue #2. I’m in love with Terry Moore. Desperately in love (don’t tell the Boyfriend). Terry Moore is my hero, he really is. I had the incredible pleasure of meeting him at Boston Comic Con this year, and he was just such a stand up guy, you know? Unfailingly nice and I totally wanted to be a spaz and just hang around his table all day. But, I’m guessing that would have freaked him out and I really didn’t need a repeat of what happened with Frank Quitely. The point is, Terry Moore is completely amazing, and I will buy anything with his name on it. I would buy a home prostate exam if it said “created by Terry Moore” on the box. So when I heard about Rachel Rising coming out, I was aaaaalllllllllll over this like white on rice. I’ve only ever read Mr. Moore’s works in collected formats—Strangers in Paradise is one of my favorite series of all time, and I’m anxious to pick up the complete edition of Echo that was just released. With Rachel Rising, though, I thought I’d try another way of reading Terry Moore by picking up each individual issue as it’s released … and so far, it’s a vastly different experience. This title begins hauntingly, as it opens with the main character literally digging her way out of her own grave. It’s apparent to the reader right off the bat that something is terribly wrong with her—I mean, in addition to the fact that she’s seemingly come back to life from what we presume to be her murder. Rachel is disoriented in making her way back from her grave to her home. She has no memory of what’s occurred, nor does she seem to notice at first the strangulation marks on her neck or the spooky manner in which her eyes change color. Her house cat, for one, doesn’t want to go near her—that alone should be a pretty big tipoff. Moore breaks the issue into scene parts and we learn just a little bit about her past life, but end with an alarming statement from another character—a statement on which I gather the rest of the series will decidedly rest. The artwork, as always, is fantastic. I love that Mr. Moore does not color his work—it functions especially well on a book like this—and his lines, transitions, and panel work is crisp as it ever is. The only downside I can find to his art, if there is one at all, would be that the main characters from his books tend to look very similar. Rachel looks a lot like Katchoo from SiP, who also looks a lot like the girl from Echo. But honestly—if that’s the worst thing about this, I’ll happily take it. And with a guy as talented as Moore, I have to believe the similarities are intentional. If I have any real complaints here, it’s just the fact that I’m not getting enough story. I desperately want more. I want the next issue right now, and I want to know what went down that got Rachel to that grave. While I don’t typically go for horror as a genre (Walking Dead aside), I don’t mind it if it has a purpose, and if the storytelling is good, then I’m there. There’s no question I’m on this ride ‘til the end. Can Rachel rise above the glass ceiling of indy books and break into the Top 100? That would be a first for me. Eighteen years of books, and I’ve never been in the Top 100. Ultimately, I don’t decide that… you do. I know the comics industry is particularly preoccupied right now, but I’m going to do everything I can to make Rachel impossible to ignore. Anything you can do to help her find recognition in our hero-centric comics world would be great, because everything you post gets reposted by a dozen other people and so on and when a lot of people talk about something, things happen. So, what do you think? 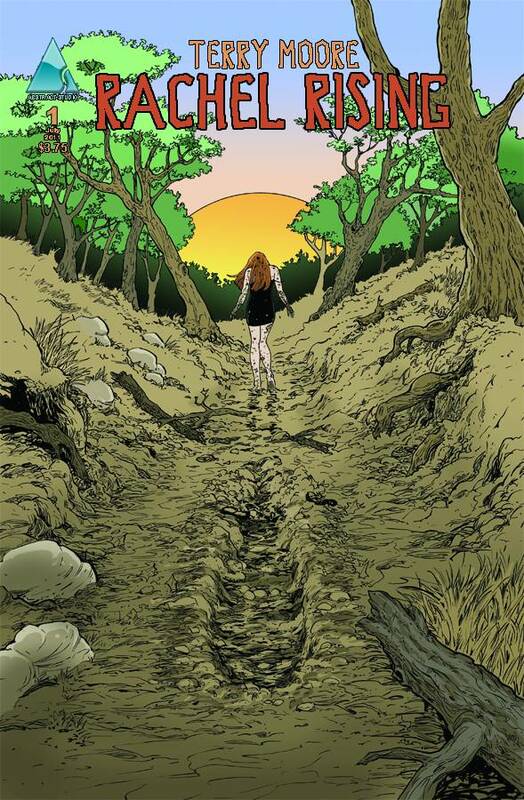 Will you support Rachel Rising? Will you forego at least some of the anticipated garbage you know will come out of “the New 52” and “Fear Itself” in order to support an independent like this? Give it a shot. Rachel—and Terry Moore—are worth it. This entry was posted on 08/19/2011 by ravenhaired. It was filed under Comic books, Female Characters / Creators, Reviews and was tagged with David Lopez, G. Willow Wilson, Marvel, Mystic, Rachel Rising, Terry Moore. Just read Mystic #1. Yes! the cliched start didn’t bother me. The coloring is crazy good. The last page with the tears streaming down the girl’s face? A real punch in the gut. I’m definitely on board for this series.